To Build Strong Nation through Dedication. To create, preserve and promulgate knowledge of civil engineering and thereby, contribute to the social, cultural, and economic well being of the society. To maintain highest possible quality of civil engineering courses for developing competent, cultured, and responsible human resource. To design, develop and direct activities of civil engineering discipline. To extend civil engineering facilities to stakeholders. To undertake Research & Development activities in civil engineering. To develop entrepreneurship amongst the students. Civil Engineering is traditional branch of Engineering and is amongst the founding courses when the institution was started. 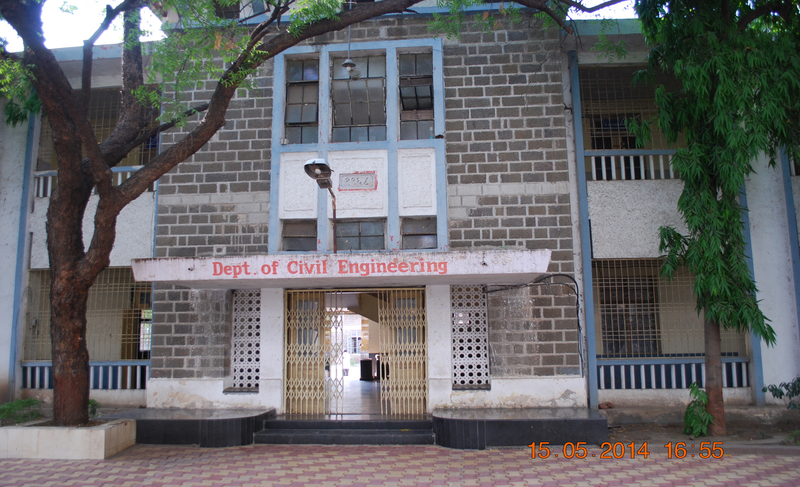 The department is located in the 'Annexe' building of the college. The Department of Civil Engineering conducts both full time and part time undergraduate courses in Civil Engineering. It also conducts postgraduate programme in Water Resources Engineering and a part time Post-Graduate programme in Soil Engineering. The department has been engaged in various activities involving industry - institute interaction, research and development, updating curriculum, improving teaching / learning process, development of students and services to society etc. Testing and consultancy services are provided in Environmental Engineering, survey and investigations, Transportation Engineering, Soil Engineering, Building Construction, Water resources Engineering and Structural Engineering. Besides the testing and consultancy activities, the faculty is actively engaged in various research and development projects and infrastructural development activities through the grants from AICTE, UGC, TEQIP etc. Sophisticated and advanced equipments / instruments are available in department. The faculty of the department are invited to deliver technical lectures in various study areas / subject fields from Civil Engineering at various Government / Private organizations or technical institutions. Civil Engineering Students association (CESA) organizes and conducts various programmes and activities for overall development of students. Students are encouraged to arrange and participate in technical events and the department faculty provides necessary guidance to students for the same. Technical Visits to various construction and project sites as well as research laboratories / organizations are arranged so as to give field exposure to the students. Under TEQIP scheme i) Training programs are arranged for faculty. ii) Faculty members are deputed for various training programmes arranged by reputed organisations. iii) Various programs / workshops are organized. In addition, all the routine civil maintenance works in college campus are carried out by the supporting staff. 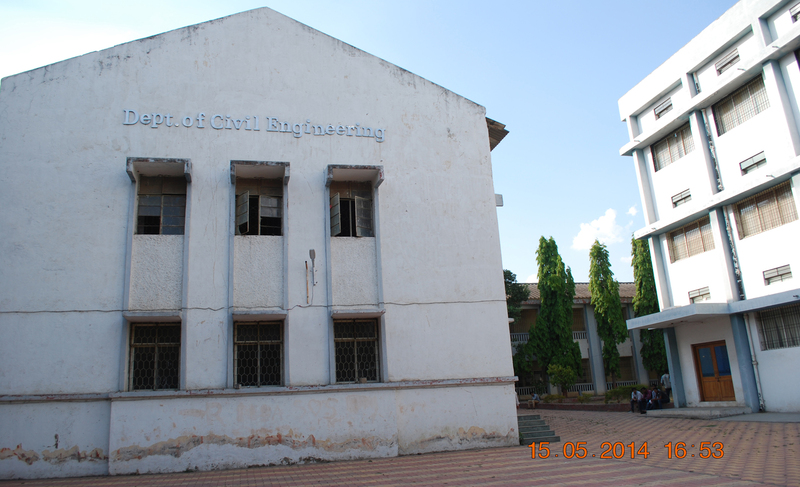 Civil Engineering Department is working right from the inception of the college in 1960. Since then the department has made continuous progress and development. 1.Department is having highly qualified, experienced faculty. The faculty is dedicated. Faculty has contribution to technical journals and conferences in Civil Engineering. 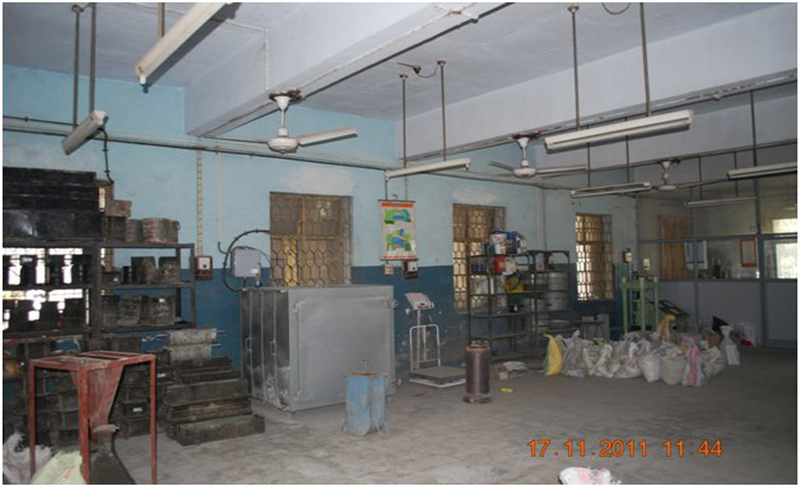 2.Different laboratories from the department are equipped with the modern equipments, machinery and experimental set ups. These laboratories undergo modernization and development so as to be consistent and compatible with professional field requirements. 3.Computer laboratory at department provides internet connectivity and access to various softwares through sufficient number of computer systems having latest configuration. 4.Faculty from department makes use of modern facilities and techniques during classroom teaching. Faculty regularly uses of LCD projector, power point presentations and e-learning packages. 5.Department has established excellent liaison with govt., local bodies, and industries to render services and expertise. Faculty of the department has established itself as reliable consultancy groups in various sub-streams in Civil Engineering. 6.The government departments, local bodies and industry in Maharashtra especially from Marathwada region refer the problems to the department. The consultancy work is done in a cohesive faculty group with constant interaction and cooperation. Thus, there is a continuum and reliability of service to the society. 7. Number of students who graduated from this department have already been well placed at high positions in different govt. and private organizations. Besides, many have started their own firms and have attained reputed positions in the society. 8. Final year students from Civil Engineering get placed through campus placement cell in reputed Construction companies and organizations. Graduates will have successful career in Civil engineering profession and diversified sectors. Graduates will plan, design and execute civil engineering and multidisciplinary projects to meet desire needs within realistic constraints such as financial, environmental, social, ethical and sustainability. Graduates will use techniques, skills and modern engineering tools necessary for successful engineering practice for overall development of the nation and society. Graduates will excel in Profession, Higher studies and Research & Development activities. an ability to apply knowledge of mathematics, science and engineering to solve civil engineering problems. an ability to identify, formulate and analyze civil engineering problems. an ability to complete task to meet desire needs, within realistic constraints such as financial, environmental, social, and sustainability. an ability to communicate and interact effectively with the stakeholders. an understanding of the elements of project management and finance. This laboratory houses sophisticated computers, lap tops and printers. Computer laboratory is located in Annex Building. It is divided into two sub parts as UG and PG laboratory. Road master, SPSS, Fluid Flow, STRUDS, AutoCad, Geomatics, Water Treatment, Sewage System Design, MATLAB, Effluent Treatment Plant.